The Best Allergy blogs from thousands of top Allergy blogs in our index using search and social metrics. Data will be refreshed once a week. Also check out Allergy Youtube Channels. Allergy newsletter is a comprehensive summary of the day's most important blog posts and news articles from the best Allergy websites on the web, and delivered to your email inbox each morning. To subscribe, simply provide us with your email address. United States About Blog Best Allergy Sites is the web’s largest informational guide of environmental allergy, food allergy & intolerance web sites & blogs. Business owners, medical professionals, educators, & writers from all over the world are doing research & publishing articles and stories to help individuals manage their allergies. Best Allergy Sites is an attempt to gather all of those resources in one place. Facebook fans 2,781. Twitter followers 8,038. San Francisco, CA About Blog This is a place for discussing remedies for allergies of all types: Food, Grass, Pet, Pollen, Mold, Cockroach, Mites, Smoke, Dust, Latex, Ragweed, Tree, Cigarette smoke allergies and so on. Facebook fans 1,072,233. Twitter followers 460,770. Mountain View, CA About Blog Comprehensive up-to-date news coverage on Allergy, aggregated from sources all over the world by Google News. Facebook fans 21,739,527. Twitter followers 212,755. Beverly Hills, California About Blog Dr. Alan Khadavi, an allergist, offers patients throughout Los Angeles an opportunity to experience total relief from their allergy and asthma symptoms. Onalaska, Wisconsin About Blog Allergychoices, Inc. is the first dedicated education, advocacy, and networking resource for patients and physicians who were interested in sublingual immunotherapy to treat allergic disease.It provides tools that enable physicians to provide sublingual immunotherapy and gives allergy sufferers information and access to practices offering sublingual immunotherapy. Facebook fans 229. Twitter followers 243. Brooklyn, NY About Blog Asthma Allergies Children is a website devoted to ideas that are within the guidelines set by accredited medical authorities for treatment of asthma and allergies. Facebook fans 1,684. Twitter followers 1,495. Canada About Blog The Adults with Allergies blog has a team of contributors across Canada. These are all adults who have worked with Food Allergy Canada on providing knowledge, advice and tips to other allergic adults. Facebook fans 5,938. Twitter followers 3,002. UK About Blog Get updates on Issues in food allergy and intolerance, coeliac disease, gut disorders, eczema, 'free from' and all allergies and sensitivities! Facebook fans 294. Twitter followers 5,174. San Francisco, CA About Blog Allergy and Sensitivity, discussion, news, advice and questions with fellow sufferers from Reddit. Facebook fans 1,073,137. Twitter followers 461,317. Fort Lauderdale, Florida About Blog Allergy, Asthma and Immunology News Updated Daily by Board-certified Allergist Dr. Dimov at Cleveland Clinic Florida. Facebook fans 1,614. Twitter followers n/a. Maryland and Virginia About Blog The Allergy and Asthma Clinical Centers provides allergy and asthma testing, diagnosis and treatment for adult and pediatric patients. They also treat patients with eczema and skin allergies, hives, angioedema and eosinophilic esophagitis. They offer testing for insect and drug allergies as well as immunotherapy as a form of treatment for patients with seasonal allergies. Facebook fans 408. Twitter followers 22. United Kingdom About Blog The latest allergy research from prestigious universities and journals throughout the world from Medical News Today. Facebook fans n/a. Twitter followers 78,010. Los Angeles About Blog (RT) is a leading source of information for respiratory care practitioners. It provides clinical information, updates on trends, practical insights, and news on allergies, its risk and treatments, allergic diseases though reasearch and journals. Facebook fans 7,303. Twitter followers 2,952. Ireland About Blog At Allergy Lifestyle their vision is to help make life a little bit easier for anyone managing allergies, anaphylaxis or asthma by bringing together a range of products and resources to help keep you safe. Facebook fans 7,204. Twitter followers 3,664. About Blog Read stories about our own experiences living and traveling with allergies, exciting product updates, and more! Founded by a lifelong allergy sufferer, our team is creating helpful allergy mangagement solutions with life-saving potential. Facebook fans 122. Twitter followers 151. Aldrin St. Plymouth, MA About Blog Plymouth Ears, Nose & Throat serves Southeastern MA in otolaryngology,audiology, sleep disorders, head & neck cancer, sinus & allergy, and reflux. This blog gives the information about the same. London, Guildford, Farnham About Blog Expert advice on urticaria, food allergy, asthma, skin allergy, hayfever and many other allergic conditions. Facebook fans 270. Twitter followers 58. Buckinghamshire About Blog The first place to look for allergy and intolerance articles, tips, new products and much more. Facebook fans 1,006. Twitter followers 4,710. Facebook fans 239. Twitter followers 12. Locations in TX, LA & NM. About Blog BreatheAmerica assembles medical specialists in one location to help you and your family find allergy, asthma, and sinus relief. Facebook fans 985. Twitter followers 310. Connecticut About Blog At Connecticut Sinus Center, they provide you with access to state-of-the-art technology and acute medical care for all your sinus ailments. Facebook fans 29,863. Twitter followers n/a. Los Angeles About Blog The Sneeze Austin allergies blog provides allergy tips, advice, allergy counts, and more to help serve Austin, TX and surrounding areas. Facebook fans 3,342. Twitter followers 7,818. About Blog The Journal of Allergy and Clinical Immunology (JACI) is the official journal of the American Academy of Allergy, Asthma, and Immunology (AAAAI). Each month, the Editors of the Journal of Allergy and Clinical Immunology select two JACI articles for discussion. Facebook fans n/a. Twitter followers 4,647. Colorado About Blog Asthma & Allergy Associates specializes in helping people find the best treatment possible. Facebook fans 528. Twitter followers 1,166. Fresno, Ca. About Blog Baz Allergy, Asthma and Sinus Center is a dedicated group of specialists for adults and children in the diagnosis and treatment of Allergies, Asthma, Sinus, Food Allergies, other allergic, Pulmonary and Immunological conditions. It is a full service medical practice serving the people of the Central Valley and Bay Area. Facebook fans 3. Twitter followers 116. New York, NY 10019 About Blog MD Allergy authored by Dr. Arthur Lubitz and Dr. Ama Alexis, featuring posts on allergies, asthma, and sinuses diagnosis and treatments on respective allergies. Facebook fans 75. Twitter followers 24. Phoenix, Arizona About Blog Adult & Pediatric Allergy Associates, provide comprehensive assessment and diagnose each patient carefully so that we can determine what mode of treatment will directly address the symptoms. Facebook fans 82. Twitter followers 9. Narberth, PA About Blog Narberth Allergy & Asthma's mission is to be your partner and advocate in the treatment and care of your allergies and asthma. Facebook fans 121. Twitter followers 50. Naples, FL About Blog CareOne Allergy is committed to treats your allergies, asthma, & skin conditions. CareOne Healthcare is the leading Allergy, Immunology, and Asthma care in the SWFL area. Facebook fans 159. Twitter followers 3. Fairfield County, CT About Blog Allergy Center of Connecticut provide high quality care for children and adults with allergies, asthma, and immune system disorders. Facebook fans 45. Twitter followers 72. Glenwood Springs, Colorado About Blog Dr. Robert McDermott, MD, Allergist of Allergy, Asthma & Immunology of the Rockies, P.C. has been providing comprehensive care to children and adults since 2008. Facebook fans 114. Twitter followers 9. Facebook fans 431. Twitter followers 11. About Blog Our mission is to make life easier for children with eczema (which by providing practical, affordable, natural solutions that are fun and appeal to your kids. Facebook fans 2,466. Twitter followers 612. Tribeca & Flatiron, NYC About Blog Hudson Allergy specialize in evaluating and testing for many allergy conditions, including Skin Allergies, Food Allergies, Seasonal Allergies, Asthma, Drug & Medication Allergies, and more. They test with a variety of methods, including different types of skin tests and food challenges. Facebook fans 1,068. Twitter followers 512. Newstead QLD, Double Bay NSW About Blog Allergy Medical is a dedicated allergy clinic committed to comprehensive patient care. It provides the most advanced and comprehensive allergy care available specially equipped for allergy diagnosis and treatment. Facebook fans 1,830. Twitter followers 429. Chetpet About Blog Allergy proofing is an organisation that focuses on Allergy Testing and Allergy care. It aims at battling Allergens that cause Asthma, Pollen and Dustmites. Greenfield, Wauwatosa, Waukesha, WI About Blog Allergy & Asthma Centers SC blog will keep you up to date on what to look out for during allergy season and asthma. DeSoto, TX About Blog An allergy blog by Dr. Joseph Pflanzer, specializes in the diagnosis and management of asthma, allergy and clinical immunology, including such conditions as allergic rhinitis (hay fever), sinusitis, atopic dermatitis (eczema), food allergy, anaphylaxis, drug allergy, angioedema (swelling) candidas, conjunctivitis and many others. About Blog Carehealthub is produced by editors and journalists dedicated to delivering accurate, trusted, up-to-date health and medical information, regarding allergy for consumers. Hampton, VA About Blog Comprehensive Allergy Testing, Allergy Treatment for Pollen, Molds and Foods, In Office Snoring Treatments, Surgery for Sleep Apnea, Nasal and Sinus Surgery, Thyroid and Parathyroid Surgery, Ear Tubes and Tonsil Surgery, Hearing Aid Fitting and Dispensing at Hampton Roads Ear, Nose and Throat Associates. Sidcup, England About Blog Allergy UK is the leading medical charity providing information, advice and support to people with allergies, food intolerance and chemical sensitivity. Facebook fans 14,119. Twitter followers 7,114. Connecticut About Blog Scratch or Sniff is a blog for parents of kids with allergies, asthma, and eczema. Facebook fans 3,168. Twitter followers 651. About - Issues in food allergy and intolerance, coeliac disease, gut disorders, eczema, 'free from' and all allergies and sensitivities. About - This blog focuses, mainly, on my professional interests (food allergy and intolerance and ‘freefrom’ foods) but there are many other topics which do not directly relate to food allergy and intolerance but about which I still feel strongly and therefore feel impelled to put finger to keyboard. About - Read more about non-IgE mediated allergies and food intolerances in our Allergy Test Blog. Our allergy blog is updated with the latest news and information. About - Do you have an allergy? Allergy Medical can help you with all types of allergy diagnosis & treatments. We offer effective treatments for all kinds of allergies. 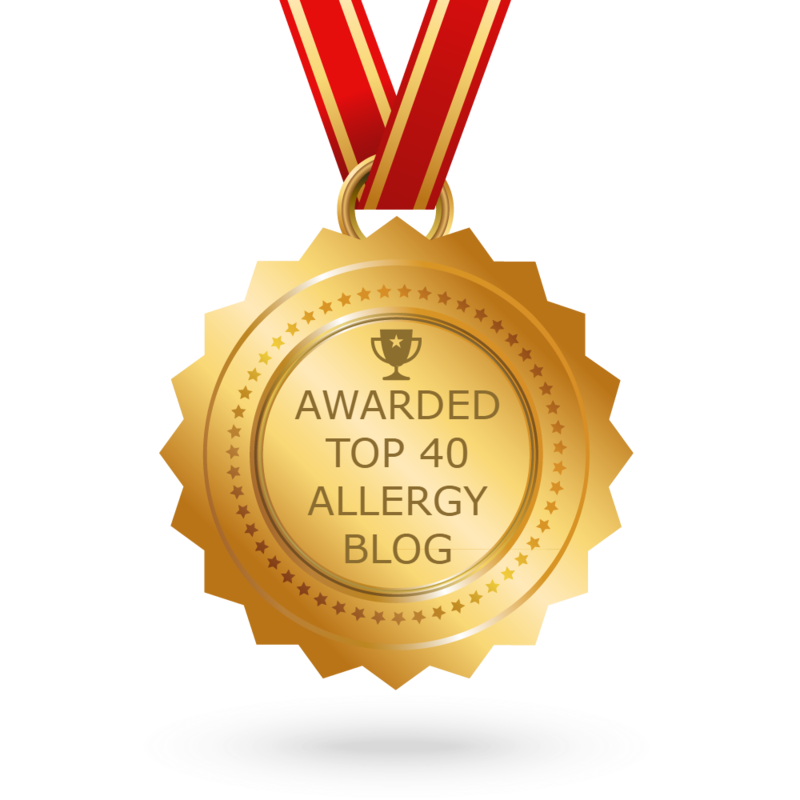 CONGRATULATIONS to every blogger that has made this Top Allergy Blogs list! This is the most comprehensive list of best Allergy blogs on the internet and I’m honoured to have you as part of this! I personally give you a high-five and want to thank you for your contribution to this world.